Genuine PANASONIC N2QAYC000121 HOME THEATRE Sound Bar Remote Control. HomePanasonicGenuine PANASONIC N2QAYC000121 HOME THEATRE Sound Bar Remote Control. 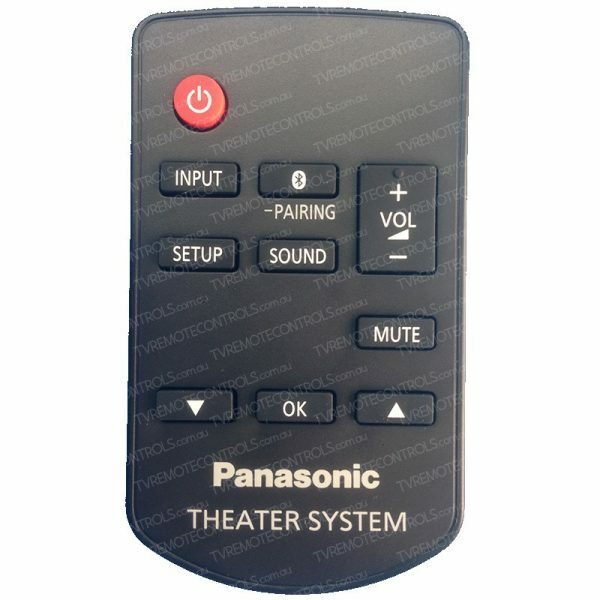 This remote control is bought directly from PANASONIC and is the exact same remote control supplied with your original PANASONIC product. Genuine PANASONIC N2QAYC000121 Audio HOME THEATRE Soundbar Remote Control. Suitable for?PANASONIC Models:?SC-ALL30, SC-ALL70, SC-ALL70T, SC-HTB580, SC-HTB680, SC-HTB680GN, SC-HTB685, SC-HTB685GN, SC-HTB690, SC-HTB880, SC-HTE80, SC-HTE80GN, SC-HTE180, SC-HTE200, SU-HTB580, SCALL30, SCALL70, SCALL70T, SCHTB580, SCHTB680, SCHTB680GN, SCHTB685, SCHTB685GN, SCHTB690, SCHTB880, SCHTE80, SCHTE80GN, SCHTE180, SCHTE200, SUHTB580.